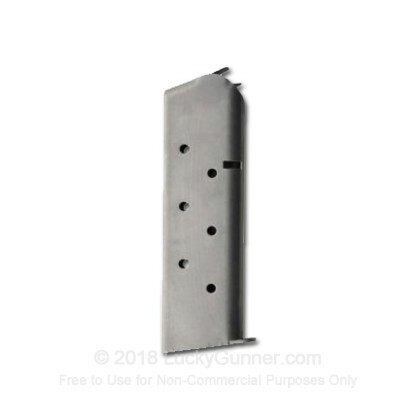 These .45 ACP magazines are an excellent choice for your 1911. Through the use of better springs and steel as well as tight manufacturing standards, Chip McCormick Custom (CMC) Shooting Star magazines have an 8-round capacity--literally one-upping the competition. They also have extra-strong feed lips to prevent cracking. Shooting Star magazines are a great example of how the classic 1911 platform has been continuously revitalized and updated through the introduction of new and better technologies and products. They were first sold in 1992 and help address one of the .45 ACP 1911's major shortcomings, limited magazine capacity. Shooting Stars are so dependable that pistol manufacturers often ship them with new guns as OEM magazines! I bought my Colt 1991A1 back in the early 90's and bought four of these 8 round CMC Shooting Star mags, two stainless two blued to go with the one Colt mag I had. I have had no issues with them in twenty years. I can easily load 8 rounds and the slide locks back on empty and the mag falls clear. I have Mec-Gar's and Kimber mags as well. I can't really tell much difference between any of them, they all seem to work well in the Colt. But I use the CMC's the most for some reason. I thought I would get one of these as it is supposedly way better than an ACT. Naw! This bugger is a tight fit and will not drop away when hitting the release. Using magic marker I found it binding on the front side (mostly) of the magazine well. Filing, sanding and buffing solved this. Removed spring and cleaned well, re-blued with Super Blue. Now it works as it should. Nothing fancy about his mag or the follower. If it were a $12.00 mag it would be a good deal, but it ain't. I bought these way back when, when they 1st came out apparently. It was in the early 90s. I am still using these, a flush fit 8 capacity mag. I can also use these in my smaller officers model. They work better than the factory mags in my full sized 1911. Q: Will be using with a Springfield Armory 1911 A-1 Mil Spec. Noticed magazine capacity is eight rounds. Will the magazine fit flush with bottom or extend past grip. Thanks for your help. A: Hello Stephen, This 8 round magazine will fit flush with any full size 1911 style handgun.